Upcoming events are concerning the site and related interests are listed here. Subscribe to posts, or join our facebook group to be alerted. This past month, on November 20, 2017, we purchased a parcel of land contiguous to the main body of our site, expanding it by roughly an acre. This parcel contained the Bethlehem Baptist Church (est. 1812) and its accompanying graves. These graves contain the remains of early church leaders, plantation owners, and many people in and connected to the Lynes family, of Foxbank Plantation. These graves date from the early 1840's to 1930. Now that we own it, the next step is to restore the markers and tombs. This purchase is the fruition of a 137 year old desire to obtain and protect this site. 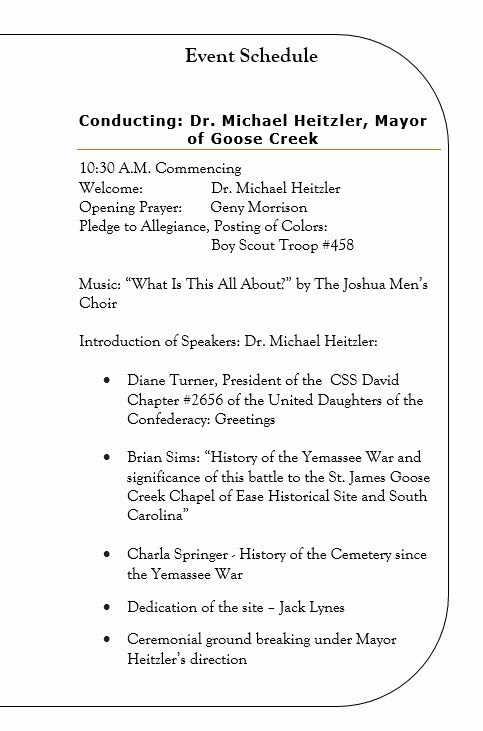 The Tricentennial Commemoration of the Battle of Goose Creek in the Yemassee War that resulted in the founding of the St. James, Goose Creek Chapel occurred on June 13, 2015. 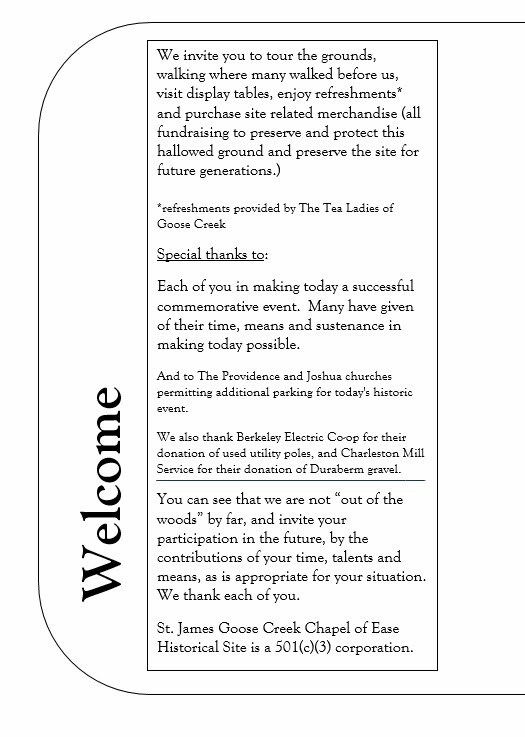 What: The St. James Goose Creek Chapel of Ease Historical Site, in conjunction with the Lord Berkeley Conservation Trust and the SC State Ports Authority has purchased historical property and protected it with a conservation easement. There will be an official announcement with many details and photographic opportunities at the site Wednesday morning, Jan 16, at 11:30 am. The St. James Goose Creek Chapel of Ease Historical Site, a newly formed non-profit organization, acquired the historic Chapel of Ease site located on old Highway 52 between Goose Creek and Moncks Corner. The occupation of the site predates the arrival of the colonists, figures prominently in the Yemassee War of 1714-15, was a place of worship and burial for Revolutionary patriots, as well as for plantation families through the War Between the States. 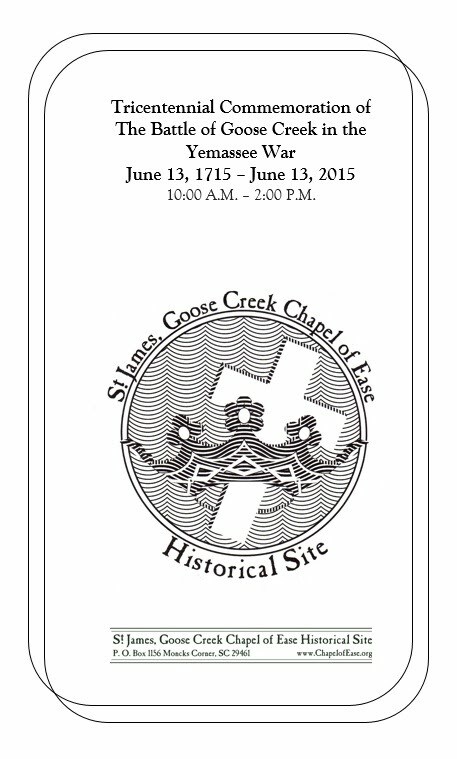 This important 22 acre locale contains remnants of inland rice fields, the foundation of the brick Chapel of Ease for the St. James Goose Creek Parish, and many graves dating from the colonial period through the 19th century. Location: The site is in the Strawberry community on Old 52, between Goose Creek and Moncks Corner. From Goose Creek, turn right onto old 52 from the 4 lane US Hwy 52, cross the railroad bridge, and proceed a half mile until you see Avanti Lane and the historical marker on the right. Follow Avanti Lane to the meeting and press conference site at the end of this unimproved road. From Moncks Corner, proceed down Old 52, past Cypress Gardens Road, to a small bridge. Immediately past the bridge find the historical marker and Avanti Lane. If you are using your GPS, Avanti Lane in Moncks Corner is easily found. For additional information use the Contact tab at the top of this page at the end. Google, Coastal Community Foundation, and Palmetto Technology Hub are pleased to host an event in Berkeley County for nonprofit employees, volunteers, and board members. Learn how your nonprofit's mission can be better fulfilled with an online presence and engagement with the public. Become more visible and more easily discovered by people interested in your mission and connect with supporters in more effective ways. Time and efforts are valuable, learn some of the basic (and free) ways your organization can operate efficiently and effectively. Bring your laptop or tablet device so you can test these tools yourself and ask questions. During this half day event, we will present on social media and Google products. While these main sessions are happening, we will also have experts available to meet 1-on-1 with attendees. Not sure what to do with Twitter? We'll have at least one expert who can provide suggestions for your org. Is Google Analytics set up but you don't know what the numbers mean? There will be someone there to review your account. 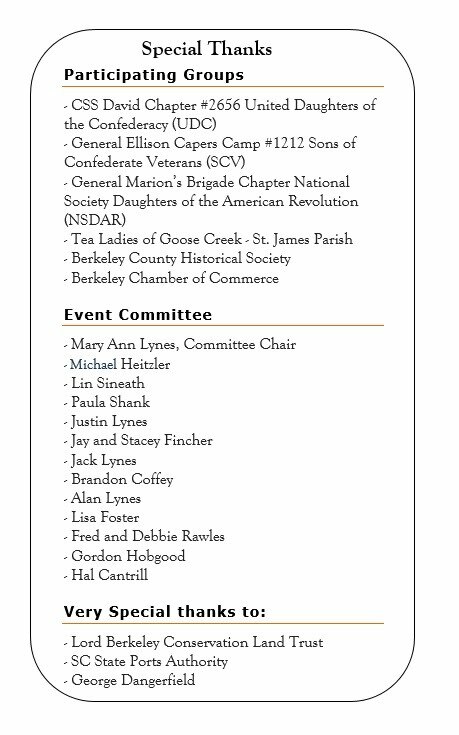 The schedule below is an overview of the event and we will continue to add details as they are confirmed. The 1-on-1 consulting will run concurrently with the sessions. (The number of available consulting sessions will be based on number of volunteers and space). Your $12 registration fee includes a continental breakfast, lunch, and a really cool Google notebook. Space is limited so register today!